If you have never done Skyline, as I never had, here are my first impressions. Your mileage may very, I'm not a particularly zippy rider. Also, there may or may not be hyperbole in the following text. Got up at 6:10am, a LATE start for me on a ride day. Usually have to haul across the city, but today I get to join the ride in my turf. Awesome. Sadly, I have two songs stuck in my head, Friday by Rebecca Black, and some track by Black Eyed Peas with excessive use of auto-tune. Horrible. These do not exit my brain during the entire trip, but form a 3 hour, hellish medley of chaos and suffering. You know how they have recommended doses on Aspirin bottles? They do not do this on mojitos. This will become apparent later. Nice, leisurely stroll from Stern Grove out to Skyline Blvd. Very pleasant, slight downhill, brisk. Feeling pretty good. 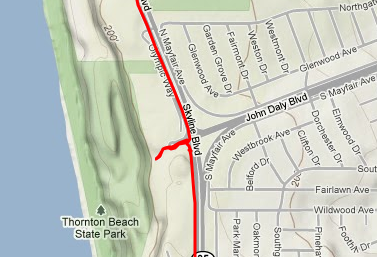 Make it to John Daly & Skyline way ahead of the regular group, and have to pee already. Go to the viewpoint to take in the sights and give a what's-what to California by tinkling into the San Andreas Fault. Angst about having to leave Seattle now reduced a little bit more. DG, Darrin and Lance arrive. Time to climb. From the SF2G Skyline description: It's not easy, but not ridiculously hard either.... BATMAN'S BALLS! The gang waits for me at the top and reassures me that this is the first of two climbs. I learn soon that this really just means this is the biggest climb and there is one more big one, but there are like 40 more in between them. Everything's going smoothly, lovely weather. San Andreas Trail is fun. Scenery is nice, hey this is great. Stop off to get some water... then... what... WHY ARE WE ON THE FREEWAY?!?!?! Adrenaline gets me safely to the next exit. Hillsborough Rollers next (not a fan.) At some point somewhere around here, I think, the temp drops to about -100 degrees for like 20 feet. I think I got snowed on. Then its instantly warm again. It is at this point that I Get It™. Awesome, fast descents. I've never done the dam, but I though the detour was fun (until the climb, again got to see my ridemates disappear into the horizon.) Cañada: 10.5 Megatons of YES. Crystal Springs Reservoir, hello. This ride makes Bayway now seem kinda gross. Moutain Home Road might be my favorite segment of the commutes I've done so far. One lane, mellowish flat or downhill in most parts. Enshrouded by trees like a scene out of Legend of Sleepy Hollow. Absolutely beautiful. Some more awesome descents. Wishing Bayway had descents like this, but as my CPA says "You don't have to pay it if you didn't make anything." I plan to make this a regular part of my SF2G repertoire, but right now I just feel the legs burning. Awesome ride, everyone, thanks for navigating me to the G!